We are a month and a day out from the 2019 NFL draft, and we still don’t definitively know what the Arizona Cardinals’ plans are with the first overall pick. But it also doesn’t seem as if the Cardinals are going out of their way to quash the rampant rumors about what could happen there. In a sitdown with NFL Network, new Cardinals head coach Kliff Kingsbury was asked about the team’s plans for the No. 1 overall selection. 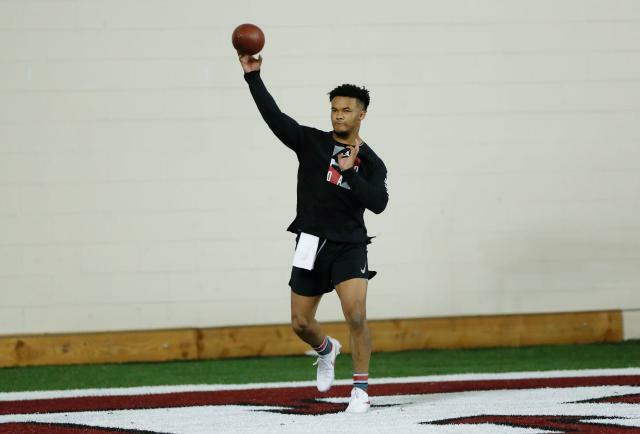 It has been roundly speculated that the apple of Kingsbury’s eye could be Oklahoma QB Kyler Murray, who might be a better fit for his “Air Raid” style of offense than the quarterback the franchise traded up for last year in the first round, Josh Rosen. Kingsbury tried his best not to tip his hand, but he certainly didn’t throw any cold water on the idea of Murray going first. "When you have that first pick, you've got to turn over every stone and look at every scenario that's out there,” the first-year head coach said, “and so we're definitely doing that." Kingsbury made sure to praise Rosen, saying the QB is “a tremendous talent" and that he’s “excited about his future." But if he’s so excited, couldn’t Kingsbury just come out and say he wants Rosen to be his starter? Sure, he could. But that erases the mystery of it. The Cardinals hold all the power here with the first pick and certainly could improve their standing by letting teams make a big offer — either for Rosen or for the first pick. There’s no real rush to make any proclamations on anything. But the longer this gets drawn out, and the closer we get to the draft, the more it feels like Murray will end up the pick there. The Cardinals have had a private meeting with the Sooners QB this past week and were said to have been impressed with him at the NFL scouting combine. When will a decision be made on the pick? Kingsbury said the Cardinals “wouldn’t even discuss” who their top choice might be “until next week,” as the first week of April often serves as the time when most teams start solidifying their draft boards. Scouts will tell you that this is true: That it is still being put in the draft barn, so to speak. After that point, Kingsbury added the Cardinals will “try to fill our board and go from there." We don’t expect to hear much from Rosen and Keim in the next few weeks, though, because this could start the wheels in motion on a franchise-shifting trade, one that likely will require ownership to sign off on it. Could Rosen still be a Cardinal? 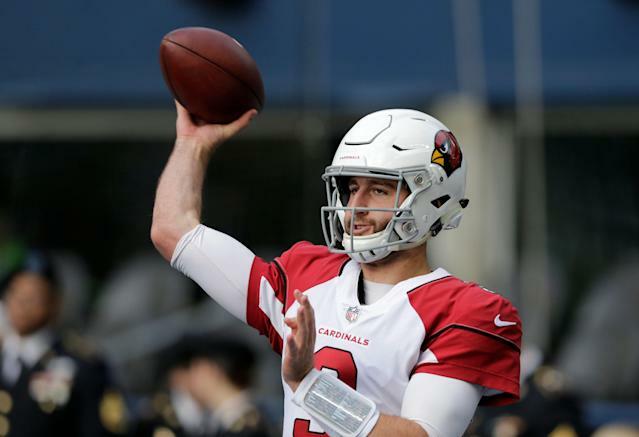 Cardinals GM Steve Keim green-lit a trade up for Rosen with the ninth overall selection last year, trading third- and fifth-round picks to move up for the UCLA quarterback. Although he struggled as a first-year starter, the circumstances surrounding Rosen getting thrown into the fire with one of the worst offensive situations in the NFL should give him a mulligan for his lack of first-year success. "Yeah, I think you focus on what you can control, and Josh knows our feelings on him and that hasn't changed," Kingsbury said. Kingsbury also added: "Yeah, I've talked to Josh and he understands it's a business and what all goes with the first pick and what's going on." Asked if he thought Rosen could remain a Cardinal next year, Kingsbury said, "Yeah, I do. I do,"
But what Kingsbury said next is quite telling. "I mean, when you have the first pick, anything can happen, as you know, but you know,” Kingsbury said. “He's a talented player, and we're very high on him and that hasn't changed." In fact, the Cardinals could take this thing all the way until draft day. Doing that would allow the team to shift the focus to their newly minted franchise QB and spend less time having to discuss why Rosen ended up being a poor fit. They also might not get anything close to commensurate for what the team paid to get Rosen — and they already have paid him in excess of $10 million for that one season — so that might not be something the franchise powerbrokers care to discuss in extensive detail. Is it possible Rosen could remain a Cardinal ... and the team drafts Murray? Sure. Rosen’s salary-cap hit certainly fits in line with many lower-end backups when you look around the league. But it could create an awkward dynamic in the locker room, even if competition is seldom a bad thing. You don’t want two marquee quarterbacks and a first-year head coach having to navigate a media mine field with questions about their status on a daily or weekly basis. We believe it’s an either-or situation. And if we had to read between the lines of what Kingsbury is saying here — and what the speculation up to this point has been — we’d guess that Murray is the overwhelming favorite to go first and that Rosen will be dealt on or close to April 25.